I’m becoming more and more convinced that Google is having serious problems with geotargeting. I’ve previously written my thoughts on the future of google geotargeting, and various other posts ranging from set-up and usage of geotargeting right through to Local Search geotrageting. Here’s the query I used. I suppose there’s some small chance that Yahoo! have geotarget their FR content to Ireland, but the servers appear to be in the UK. 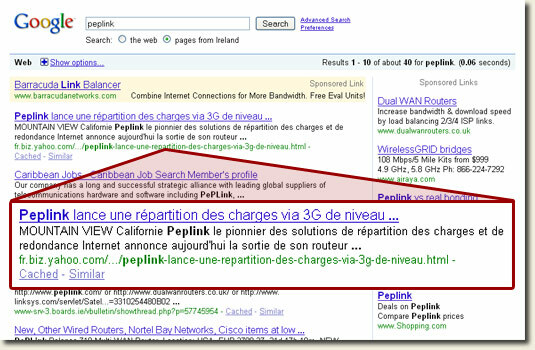 But also returning French results when my browser language is set to EN also smacks to me of serious problems. I tweeted about this earlier this morning. The results are a joke at the moment with US and Australian results in .co.uk queries. I haven’t had French or non-English results yet – but there’s time I guess! My tweet was along the lines that Google should give up on geo-targeting until it can manage to do it properly. Perhaps it works in the states but it certainly doesn’t work well in the UK. @Dan – for the last while Google’s index and the way they deliver results has been a bit messed up. I actually think they made some major change or other that didn’t go to plan, or had some unintended side-effects. @Gregor – I *hope* it will just be a matter of time before things get better once more. They dont like when the UX is poor, so you can bet they’re working hard on making things better.